This artwork is on the backyard wall of a home facing Roosevelt St. near my home. I drive or walk by it most days, and lately it has spoken much louder to me, of the urgent need for all of humanity to begin looking inward at the injustices that go on everyday, right in front of us, by us, and against us. It has made me realize that what is going on in Ferguson is a microcosm of what is at war within our hearts and minds. Whatever your analysis of Ferguson is, it would be negligent of all of us to assume that “our” understanding is the “just” view, without taking into consideration all the injustices that take place within injustice. Our story isn;t the only point of view, and we could all spin most stories in certain ways to see the rationale of why people do what they do. But we don’t want to “spin” stories, which means we must be humble enough to step out of our stories and believe that there is truth and reason from the other person’s point of view. Injustice breeds injustice. Hurt people, hurt people. To say that Ferguson is only a race issue is to ignore all the other injustices. To deny that what’s going on in Ferguson isn’t a race issue is to be ignorant of reality. To step into someones else’s story without a preconceived idea of what to expect is almost impossible, but it’s something we must work towards as neighbors and family members who share this beautiful world. Maybe we have been guilty of having “single” stories of people and events. Maybe our single story of someone or a people group has become so dominant that we have become part of the injustice against that certain group just by the very nature of not being able to get into their shoes. Maybe our single story has been shaped by news reels and stories of other people from our “tribe”. Maybe our story has been shaped in concrete from snapshots of the worst days of those in the other “tribe”. I long to get rid of my snapshot judgments and to step into the story of love that allows me to journey in the shoes of those who are different from me, to be a lover of diversity, even if that diversity is offensive to me, or even causes me to rethink the way I view or live within this world. To be an agent of change, is to be one who accepts responsibility of our thoughts and actions, and I believe if we all begin there, inflammatory moments in our world would at least have more sane people on every side looking inward before arrows are shot outward. Division is dangerous and has ravaged humanity. 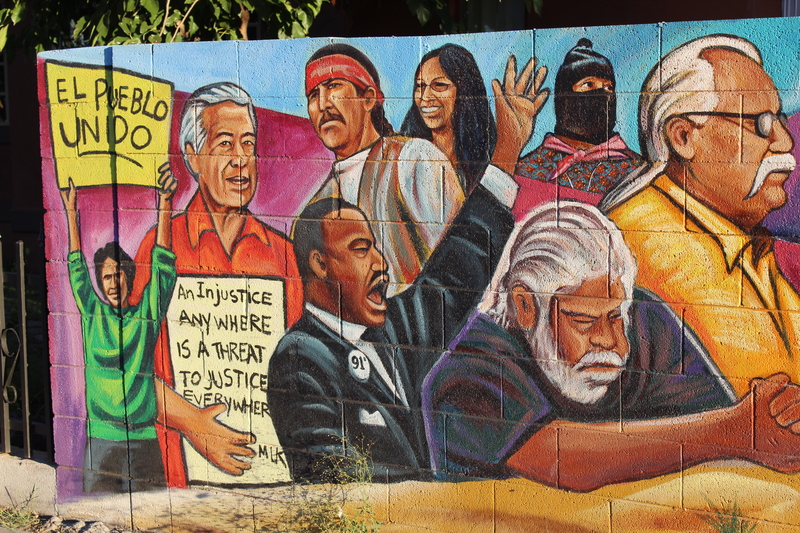 Looking inward first can give us a clue of the cause of certain divisions and can give us the tools we need to begin rebuilding and reconciling from injustices that go unnoticed day after day. This is what Jesus gives us the freedom to do. He doesn’t join anyone’s tribe or circle. He doesn’t have to defend any ideology or way of living. He is the way, and his way does not ignore injustice, nor does it exclude people. His way is full of love that pierces through lies and short-sighted worldviews. His way is peace and reconciliation that happens through broken people being accepted by him and freed up to deal with their own junk. Injustice anywhere is a threat to the way of Jesus. Renewal. This is a loaded word. It’s a word that could be debated as to what it means for a city or neighborhood. I’m aware that attempting to define what renewal looks like is subjective and will certainly lack many elements that others think should be a part of renewal, especially renewal of the urban core. This is exactly why I am writing a series of posts not on what urban renewal looks like, but on what kind of people we must look like for urban renewal to have a chance to be a reality. This is an argument from virtues (areteology), rather than an argument from duty (deontology) or consequences (teleology). The last post focused on being peaceable people, which in and of itself, cannot encompass the fullness of shalom (the way things are supposed to be). There is no peace without justice. What is happening in Ferguson, MO is all over the airwaves as well as the ISIS crisis that is killing and and displacing thousands of Christians in Iraq and Syria. There is no peace in these situations because there is no justice. If shalom is the end goal of all of creation (human and non-human creation), peaceableness is the top end and justice is the bottom floor, the foundation; they are book ends if you will. Righteous and justice seem to go hand in hand in the biblical narrative, and they actually could be defined by the term justification. In salvation terms, to be justified, is to be declared righteous before God and having been justly acquitted of one’s sin because Jesus paid for what we deserved (justice). So justice, in part, means to be free and forgiven of one’s sin, and empowered to do what is right based on the freedom one has received. This is the long and difficult way of saying that justice is that state in which everyone receives what is rightful and appropriate. Since humans are created with certain rights (food, clothing, and opportunities to work), then a society is just when everyone in the society enjoys the goods that everyone has rights to. But a society is also just when there are consequences for those who have disregarded or kept others from these certain rights as well. A city that is just is a city that respects the dignity of every human, especially within the Christian worldview that believes that every human is created in the image of God, the righteous and the wicked. At the least, in the talk of urban renewal, justice is absent whenever basic needs go unmet. This means that liberation from in-justice and deliverance from oppression are at the very core of justice. If one skimmed the Old Testament to search out who were some of the people whom God had special concern for in view of justice, you would see that it is the most vulnerable of society: widows, orphans, aliens, the homeless and hungry, the hungry and afflicted, etc. If we followed this theme throughout the Old Testament, it would be hard to ignore the loud and clear message that justice happens when the marginal ones are no longer marginal. And this Old Testament understanding of justice is fully embodied in Jesus, who was very concerned with those who were on the margins of society, those who were vulnerable and exploited by people who had the power. This can also be teased out to include all who have ever come to Jesus for salvation (the forgiveness of one’s sin and being declared right before God). We are all marginalized because of our sin, cut off from God, but because of God’s mercy and love for us, Jesus became one of us, to once and for deal with the rebellion and tyranny that we created. God brought justice to humanity through Jesus’ bloody and ugly death on a cross. The one who turns to Jesus for salvation, now stands before a just and holy God only on the merits of Christ’s righteousness that has now been assigned to us through what Jesus did to deal with the injustice of our sin against God. The righteous demands of the law—the legal expression of God’s justice—were satisfied when Christ was put to death and suffered the torment of separation from God, in our place. In simpler terms, it is because the “just” paid for the injustice of the “unjust”, that we can be granted mercy and grace as people on the margins, and be brought near to God (no longer in the margins). This is justice, which flies in the face of a Western view of justice, which would condemn all of us, if we indeed held ourselves to the standard of justice that we hold others to. Justice doesn’t make sense to a world committed to the three P’s: progress, profit, and pursuit of happiness. When we see injustice happening in our city, it usually means that we will have to miss out on one or all of the three P’s if we’re going to stand against it. There’s no money in it for those who want to plead the case of the widow, feed and clothe the naked, or stand against oppressive systems and structures that abuse and exploit the weak. Actually, downward mobility is to be expected if one is going to give their lives to this kind of justice. The result of living a life of justice in the biblical sense in our 21st century Western society, most of the time, means that we lose ground on the three P’s of our culture and this is not very attractive, at least not long term. To see renewal happen in cities then, I am convinced that we will need an uprising of men and women who are willing to not be controlled by the three P’s, courageously living as an alternative community in the midst of our over-indulgences and commitments to the bottom line and financial sustainability. This will not be an easy lot for the pioneers of renewal, but justice has never been an easy virtue to live by. After all, justice on God’s part was very costly. What are you willing to give up to live a life of justice in your city? Is the promise of comfort too seductive for you to make radical changes? Ultimately, justice will always prevail, with or without us, but we do have a choice to be on the “just” side, but it’s not attractive nor easy these days. Paul’s “therefore” comes on the heels of talking about the resurrection of Jesus, the resurrection of the dead, the resurrection of the body, and the great mystery of our work here on earth not being in vain. If our work is not in vain, then it is actually accomplishing something for God’s kingdom. When Jesus comes onto the scene at the beginning of Mark’s account of the gospel (MarK 1:14:15), He said “…the kingdom of God is at hand”, which basically means, “Good news, the King is here and so is peace!” Imagine for a moment with me, the reality of the Kingdom of God being at hand: shalom (peace with justice, new life, goodness, beauty, redemption, reconciliation, etc…). And then after this announcement, Jesus did justly among the poor and marginalize, he corrected the religious leader who thought they had the corner on doctrine, he healed and touched the untouchables and the dark horses, then he proceeded to move towards the cross to pay for (literally, to take on himself) our sins and the consequences we deserve for thinking we can play the role of God, so that God’s Kingdom could be realized (seen) in and through our lives. But Jesus was not only satisfying the payment for sin… He was at that moment while dying on the cross, preparing and displaying for us a new way to be human. the weak become strong. The foolish confound the wise. The last become first. The powerless become powerful. And through the resurrection, Jesus began creating a new people who will be mediators of God’s redeeming power for other people, cultures, and creation itself. He’s building an army, not just laying out a plan of salvation. “Atonement, redemption and salvation are what happen on the way (of God launching His kingdom, the cross) because engaging in this work demands that people themselves be rescued from the powers that enslave the world in order that they can in turn be rescuers.” N.T. Wright, Surprised by Hope, 204. Those who stop trusting in themselves and other futile things, and begin trusting in Jesus, they are being made into an army that fights not through force and persuasion, but through selflessness, death, weakness, and sacrifice. We are redeemed not just to receive what God has for us (although we desire what He has for us), but so that others may as well be delivered from the clutches of Satan, sin and death. We, having been called into God’s kingdom, are now summoned to advance this public truth about God’s kingdom (Matt. 11:12), his good and gracious rule, and partake with Him in the gathering of His church (present and eternal). So… therefore, my beloved brothers, be steadfast, immovable, always abounding in the work of the Lord, knowing that in the Lord your labor is not in vain. (1 Cor. 15:58). God is using His army of redeemed people, not only to display His kingdom, but also to create and build the new heaven and new earth, through every righteous deed done in the name of Jesus, by the power of the Holy Spirit. Ultimately, this is not our doing because we have died in Christ and live by the power of the Holy Spirit. Christ Jesus, through the Spirit, has been working on the new heaven for over 2000 years through redeemed lives here on earth (us! ), sowing seeds of righteousness that will produce a thousandfold return! Oh how this has the ability to change our view of the resurrection and Christian mission. Every act of love, gratitude and kindness, proclamation of truth in love, every act of justice done in the name of Jesus, is us partnering with God in storing up treasures in heaven that will never pass away and will be for all of the redeemed to enjoy! This is our mission in light of the resurrection! But here’s the sad part of this story. 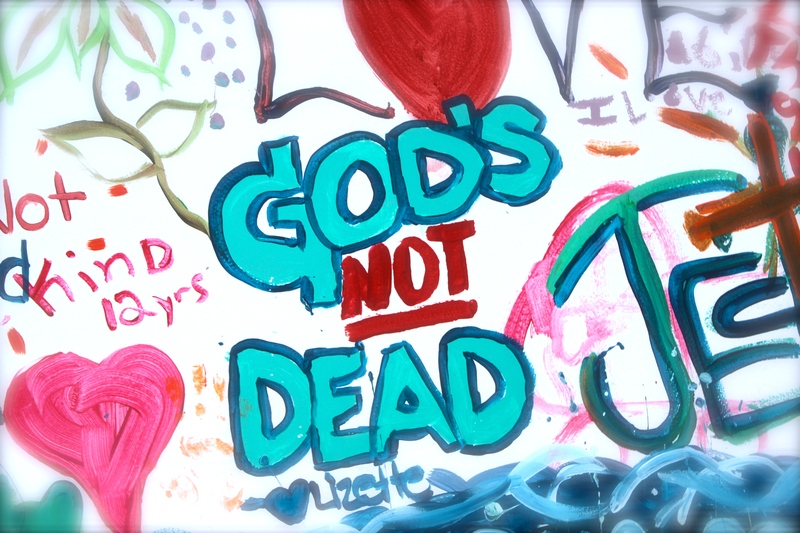 Many people say with their lips that God is not dead, but then live most of their lives as if He is dead. This is not the kind of witnessing army that Jesus dies to give life. The life God gives through faith in Christ is life that moves in rhythm with God’s kingdom: mercy, justice, forgiveness, confession of sin, standing up for dark horses, sharing, trusting, loving. We are called to live as if God is not dead. May we be a people who live as if God’s alive before we dare proclaim it. We are called to plant “kingdom-signposts”, to display the beauty and worth of Jesus, to walk in freedom, love, humility, shalom, and in the grace of God’s good and coming kingdom. Demonstrate it. Embody it. Then announce it. Include the poor & marginalized. Pray. Embrace suffering. Rejoice in weakness. Gather together in community. And remember, that God’s kingdom comes by the Spirit of God moving in response to prayer!